"G-1/41AN21-9" by Timothy K. Perttula and Robert Z. Selden Jr.
DECORATION (INCLUDING MOTIF AND ELEMENTS WHEN APPARENT): The rim has two horizontal engraved lines that encircle the vessel, and these lines have upwards- and downwards-pointing excised tick marks. 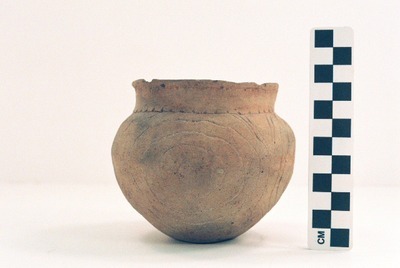 The vessel body has an engraved concentric circle motif repeated four times around the vessel. Poynor Engraved, var. Freeman bowl from the Mrs. Emma Owens site.